[193 Pages Report] The global endodontics market is expected to reach USD 1.61 Billion by 2022 from USD 1.21 Billion in 2016, at a CAGR of 5.1% from 2017 to 2022. Growth in the global endodontics market is mainly driven by factors such as the rapid growth in the geriatric population, increasing number of dentists and dental practices, rising dental tourism, and increasing dental expenditure along with an increase in disposable incomes. Top-down and bottom-up approaches were used to validate the size of the global endodontics market and estimate the size of various other dependent submarkets. Major players were identified through secondary research, and their market revenues were determined through primary and secondary research. Secondary research included the study of American Association of Endodontists (AAE), International Federation of Endodontic Associations (IFEA), FDI World Dental Federation, Asia Pacific Dental Federation (APDF), European Society of Endodontology (ESE), and the annual & financial reports of top market players, whereas primary research included extensive interviews with the key opinion leaders such as CEOs, directors, and marketing executives. The percentage splits, shares, and breakdowns of the product markets were determined using secondary sources and verified through primary sources. All possible parameters that affect the market covered in this research study have been accounted for, viewed in extensive detail, verified through primary research, and analyzed to get the final quantitative and qualitative data. This data is consolidated and added with detailed inputs and analysis from MarketsandMarkets and presented in this report. The prominent players in the endodontics market are DENTSPLY SIRONA (US), Danaher Corporation (US), Ivoclar Vivadent (Liechtenstein), Ultradent Products (US), Septodont Holding (France), FKG Dentaire (Switzerland), Brasseler USA (US), MICRO-MEGA (France), DiaDent Group International (Canada), MANI (Japan), COLTENE Holding (Switzerland), and VOCO (Germany). The global endodontics market is estimated to reach USD 1.61 Billion by 2022 from USD 1.26 Billion in 2017, at a CAGR of 5.1% during the forecast period of 2017 to 2022. This market is mainly driven by rapid growth in the geriatric population, increasing number of dentists and dental practices, and increasing dental expenditure along with an increase in disposable incomes. However, the limited reimbursement for dental procedures may hinder the growth of this market to a certain extent. In this report, the market is segmented by product, end user, and region. 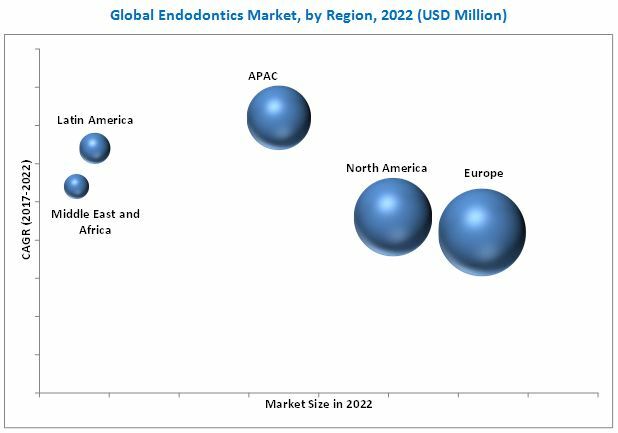 The report discusses key market drivers, restraints, opportunities, and challenges in the global endodontics market and its submarkets. Based on product, the market is segmented into consumables and instruments. The consumables segment accounted for the largest share of the market in 2016, and is expected to grow at the fastest CAGR during the forecast period. The large share and high growth of this segment can primarily be attributed to the increasing number of root canal procedures worldwide. By consumable type, the endodontics market is segmented into the shaping & cleaning, access preparation, and obturation. The shaping & cleaning segment accounted for the largest share of the endodontic consumables market in 2016 and it is also is expected to grow at highest CAGR during the forecast period. This is mainly due to the increasing prevalence of dental caries and rising number of root canal procedures that require these consumables. Geographically, Europe represented the largest regional market in 2016, followed by North America. Although, Europe will continue to dominate the global endodontics market during the forecast period, the Asia Pacific (APAC) region is expected to be the fastest-growing geographic market in the coming years. Growth in this region is driven by the rising incidence of periodontal diseases, increasing disposable incomes in emerging APAC countries, growing awareness on dental hygiene, and increasing number of dental practitioners in this region. The unfavorable reimbursement scenario for dental procedures is an important factor expected to restrain the growth of this market to a certain extent. Furthermore, the shortage of dental professionals during the forecast period presents a major challenge for the growth of the global endodontics market. Major players in this market are continuously focusing on securing higher market shares through product launches, expansions, agreements, partnerships, and acquisitions. The prominent players in the endodontics market are DENTSPLY SIRONA (US), Danaher Corporation (US), Ivoclar Vivadent (Liechtenstein), Ultradent Products (US), Septodont Holding (France), FKG Dentaire (Switzerland), Brasseler USA (US), MICRO-MEGA (France), DiaDent Group International (Canada), MANI (Japan), COLTENE Holding (Switzerland), and VOCO (Germany).